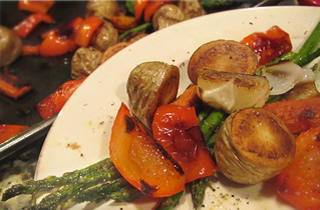 Roasted vegetables | Roasted vegetables – oh, that's tasty! 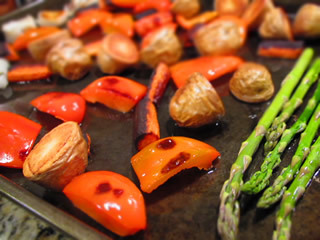 The first time I had roasted vegetables was in one of our favorite restaurants on The Plaza in Kansas City. I was blown away by the flavor! This was nothing like any boiled, steamed, pan-fried or grilled vegetable I had ever had. The carrots, onions and peppers tasted like they’d been drenched in a just-sweet-enough sauce. The potatoes were perfectly salted and savory. I asked the waiter what they did to make the vegetables so sweet. “They’re just roasted with a little olive oil, salt and pepper,” he replied. “There’s no sugar?” I asked, incredulous. He assured me there was not. 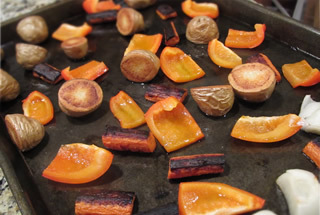 When we returned home, I hunted down some recipes for roasted vegetables. None of them called for sugar. I tried one. And just as the waiter had sworn, roasting them brought out their hidden sweetness. After a few experiments, this is the recipe we’ve settled on. It’s become a standard on the Thanksgiving table, and a family favorite. In fact, my daughter’s request for dinner tonight, before she heads back to the land of dorm food, was chicken with mushroom sauce and roasted vegetables. Note: to double the recipe, use two pans. Vegetables should not be crowded in the pan. Preheat oven to 400 degrees F. Grease roasting pan with 1 tablespoon olive oil. 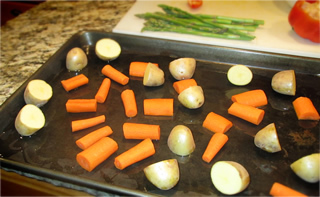 Place the carrots and potatoes onto the pan, and toss to coat with oil. Give them plenty of room. If the pan is too crowded, the veggies will steam, not roast, and you won’t get that lovely caramelization. Bake in the preheated oven for 30 minutes. Remove the pan from the oven and turn each piece over. Don’t be afraid if the carrots are looking really dark, even almost black. Just taste one! To remove the woody end of the asparagus, just bend the stalk gently until it snaps in two. It will naturally break where the woody part becomes tender. After the onion and bell pepper have had their 10 minutes, add the asparagus. Sprinkle all with herbs, if using. Continue baking until all of the vegetables are tender, about 10 minutes more. Once tender, remove from the oven, and allow to cool for 10 – 15 minutes in the pan. Sprinkle with salt and pepper, if desired. Serve warm. Learn how to deal with your new popularity.